Sport Ireland chief executive John Treacy has said his understanding is that "John Delaney isn't part of the FAI any more". As the Football Association of Ireland crisis continued, ex-CEO and current executive vice-president Delaney offered to step aside on Monday. On Tuesday, Irish Sports Minister Shane Ross said all FAI board members will be stepping down. Treacy's made his comment at the launch of the 2018 Irish Anti-Doping review. "John Delaney has voluntarily stepped aside. I can't really comment on that because that is a contractual piece with the FAI but from what I gather, John Delaney isn't part of the FAI any more," added the Sport Ireland chief. "He is on gardening leave, or whatever the description is. We have to park that and get on with our business. "We have people within the FAI that we are working with. We are going to continue to work with them and see some of the reforms implemented over the next number of months because we have to pave a way for the AGM in July." Speaking at an Irish parliamentary committee hearing last Wednesday, Delaney insisted that he had acted in the best interests of the game when he loaned the organisation 100,000 euro. However after making his statement to the parliamentary committee, Delaney, citing legal advice, refused to answer any further questions on the loan or the financial circumstances of the FAI. 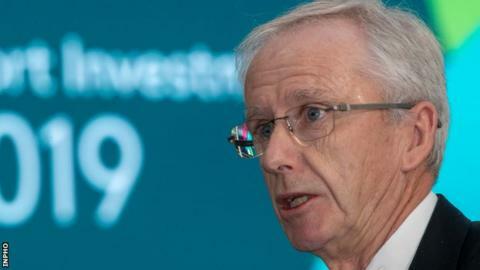 In his comments on Wednesday, Sport Ireland chief Treacy said the football governing body had to be led by the its board - rather than its chief executive. As the crisis emerged last month, Delaney was moved from the chief executive role to the newly created position of executive vice-president. Treacy added that the review of FAI governance which, in agreement with Sport Ireland, will be undertaken by Aidan Horan of the Institute of Public Administration, will ensure the "board of the FAI have the right skills". "The board of the FAI must lead the organisation, not the chief executive. That is a lesson that everyone within the FAI has learned. "The culture will take longer, and we realise that, but it's making sure that you bring in the expertise that's required. "You need independent people. You have to have people that know the sport on the board but you need people of independent mind that can make the right decisions for the right reasons." Last week, Sport Ireland announced it had suspended funding to the FAI with the governing body having thus far only received 1.45m euro of scheduled 2.9m 2019 allocation. Sports Minister Ross said on Sunday that the ongoing FAI could see it becoming ineligible for capital sports grants. Another investigation by the Office of the Director of Corporate Enforcement is also underway after it emerged that the FAI's auditors Deloitte had reported it for a failure to keep proper accounts.